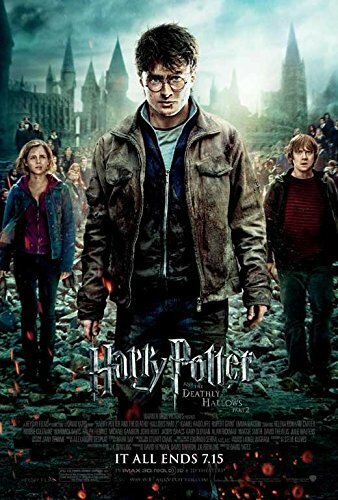 Harry (Daniel Radcliffe), Ron (Rupert Grint) and Hermione’s (Emma Waston) search for the remaining Horcruxes brings the back to Hogwarts, where the final battle for the fate of the wizarding world rages on. Harry Potter and the Deathly Hallows: Part 2 is near enough all action. It’s thrilling and spectacular action too. The battle of Hogwarts is thrilling and brutal. School kids get hurt, teachers fight and there’s so many loved characters in peril. With so many people on either side of the battle field, it has all the scope of an epic war movie, and it feels like one too. Especially as it packs an emotional punch when there’s naturally casualties of war. In amongst all the explosions and magical firefights, there’s some lovely little character moments too. Neville (Matthew Lewis) gets his time to shine, being a natural hero and leader to those left behind at Hogwarts. Professor McGonagall (Maggie Smith) standing up for her students and protecting her school is wonderful, as is any moment between any members of the Weasley family. The performances are all brilliant. Supporting actors like Alan Rickman get the chance to show off a more nuanced performance as Snape. Likewise, Ralph Fiennes’ Voldemort is not just the shouty villain we’ve seen previously; here he is scared, angry and powerful, an intimidating presence that seems to be on the edge of either victory. Radcliffe, Watson and Grint have all matured in their roles, each giving a powerful performance as their characters arcs some to a close. This trio is the heart and soul of this film, and the franchise as a whole, and they all do their characters proud. Harry Potter and the Deathly Hallows: Part 2 is an incredibly satisfying and exciting conclusion to the Harry Potter series. 5/5. 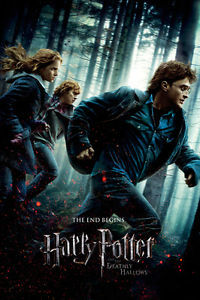 As Voldemort (Ralph Fiennes) and his followers gain more power, Harry (Daniel Radcliffe), Ron (Rupert Grint) and Hermione (Emma Watson) race against time to destroy the remaining Horcruxes and to learn more about the three most powerful objects in the wizarding world – the Deathly Hallows. Harry Potter and the Deathly Hallows: Part 1 is the penultimate film in the series and as the source material is packed full of new information and big reveals, it makes sense that this is the book they chose to split into two films. This does mean this film has a bit of a non-ending but besides from that it’s a great build up to the final showdown between good and evil we’ve been waiting so long for. Harry Potter and the Deathly Hallows: Part 1 is more character-focussed than a lot of its predecessors, delving into the psyche of the main trio as they face a situation that feels truly hopeless. From the very beginning of the film, there’s threat in the air and characters that we’ve known for years get hurt or even die. It’s a film that starts with a bang and continues at a steady pace, blending the character drama with moments of tension and action. There is more of the characters just walking and talking as Harry and his friends know they are meant to find and destroy Voldemort’s Horcruxes, but actually doing that is another matter entirely. The chemistry between the trio and the assured and mature performances, make these many scenes engaging. Still, when there is a more action-packed sequence, the tension is increased and they are always well-shot and exciting. 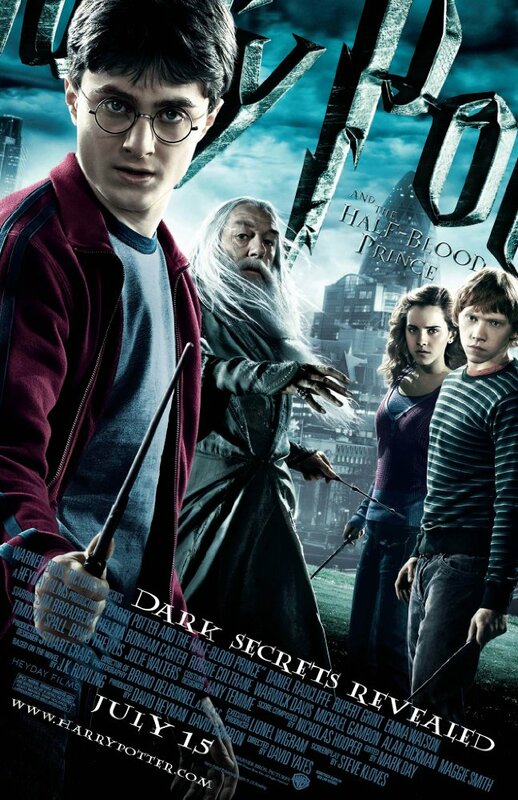 Harry Potter and the Deathly Hallows: Part 1 is a great build up to the final battle. It’s a grim situation Harry and his friends are in, but there are moments of happiness and hope to be found here, which reiterates their belief that there’s something worth fighting for and good can win. 4/5. As Harry (Daniel Radcliffe) starts his sixth year at Hogwarts, Dumbledore (Michael Gambon) starts to teach him more about Voldemort’s past. Meanwhile emotions are running high as Ron (Rupert Grint) gets a girlfriend and Draco Malfoy (Tom Felton) appears to have a secret. At the heart of Harry Potter and the Half-Blood Prince is a mystery, in fact there’s a few of them. There is the secrets of Voldemort’s past and what the new Potions teacher Professor Slughorn (Jim Broadbent) has to do with it. There’s the mystery of the old potions book marked as “the property of the Half-Blood Prince” that Harry is using to get him to the top of the class. And there’s the mystery of what Draco’s planning. With all these potentially heavy plot threads, it’s a good thing The Half-Blood Prince is very funny at times. That comes from these teenage characters acting like teenagers and the great chemistry a lot of them have. There’s romance, heartbreak and miscommunication and it all comes together with these young actors who have grown into their roles. Rupert Grint has always had great comic timing but Daniel Radcliffe shines in this film and it turns out he can be pretty funny too. Draco is such a tragic character in this film. Every time we’ve seen him previously he’s been horrible and mean for the sake of it, but in The Half-Blood Prince he’s clearly conflicted. While he doesn’t have a big role, when he is in on screen Tom Felton is wonderful. While the performances are great, The Half-Blood Prince left me feeling a little bored. It’s a very informative film and the pace of it really slows down at some points. When there are big computer-generated set-pieces they are often thrilling, but in between them with all the teen angst it can feel a bit dull. The colour palette of this film is also dull. It leaves everything feel very cold and looking washed out, though admittedly when there’s scenes with fire those bright orange colours sure do make an impact. In scenes in Dumbledore’s office it almost takes on a sepia tone which is a bit odd too. While Rupert Grint is still great as Ron, Ron is unfortunately side-lined a lot in pivotal moments. This is never more noticeable than in the final scene where Harry and Hermione (Emma Watson) are having a meaningful discussion and Ron doesn’t say one word, just sits in the corner looking glum. I don’t know if he did have some lines that were then cut but having him not say anything makes him look like a third wheel to Harry and Hermione’s friendship which is simply not the case. I think (though we’ll have to see what I make of the two Deathly Hallows films on rewatch) The Half-Blood Prince is my least favourite Harry Potter film. There’s (naturally) a lot of stuff from the book left out but this is the first film where you notice that, for instance there could have been more about Voldemort’s past to flesh him out as a villain and cut down on some of the romance stuff. Harry Potter and the Half-Blood Prince is a film that’s building to something big, but it doesn’t really have the payoff one might be expecting. Still, it’s by no means terrible and it’s a decent addition to the series. 3/5. On the run up the release of Fantastic Beasts: The Crimes of Grindelwald I’m rewatching and reviewing all the Harry Potter films, including Fantastic Beasts and Where to Find Them, as they’re films that made up a big part of my childhood but I’ve never reviewed them before. 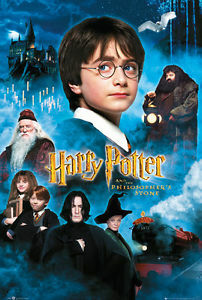 Orphaned Harry Potter (Daniel Radcliffe) discovers he’s a wizard and joins the Hogwarts School of Witchcraft and Wizardry where he makes new friends and rivals and learns that there’s an evil that haunts the magical world. It’s hard to talk about the Harry Potter films individually when you’ve seen the entire series and have read the books. You know where all these characters end up and The Philosopher’s Stone sets up so many character arcs and mentions so many people or items that will become more important later on in the grand scheme of things, and it does it all so well. With hindsight I appreciate The Philosopher’s Stone a lot, it’s a perfect introduction to this whole new magical world, taking the time to explain things while still having a compelling mystery at its core. While he’s learning magic and potions, Harry meets Ron (Rupert Grint) and Hermione (Emma Watson) who soon become his best friends. When they’re not in classes the three of them stumble across a massive three-headed dog and soon get involved in a secret hidden in their school. Harry Potter and the Philosopher’s Stone works so well because one of its main story elements is the adults don’t or won’t believe the children, so they are the ones who have to go on a potentially dangerous adventure to save the day. Everyone has been a child so it’s a situation we can all relate to. The main young trio Radcliffe, Grint and Hermione Watson give fine performances but it’s the adult cast that’s built around them that manages to be great but at the same time never overshadows their child co-stars. Richard Harris as Dumbledore is brilliant, he’s wise and calm but it’s clear he’s powerful and respected. Maggie Smith and Robbie Coltrane, as Professor McGonagall and Hagrid respectively, both bring warmth and humour to their roles. It’s Alan Rickman as Professor Snape that really stands out though. He plays Snape with such nuance that he’s an intriguing character from the outset. Harry Potter and the Philosopher’s Stone is so bright and colourful which you appreciate more when you think about how dark, both in tone and colour palette, the latter films get. While some of the special effects have not aged so well, the Quidditch match is still thrilling to watch. The score is beautiful, and it’s funny going back to the beginning because these musical cues have become so iconic, and who knew this music would be here to stay. Harry Potter and the Philosopher’s Stone is a great family film. It’s funny, exciting and has a compelling mystery at its heart. It’s a great starting point for adapting the books. 5/5.